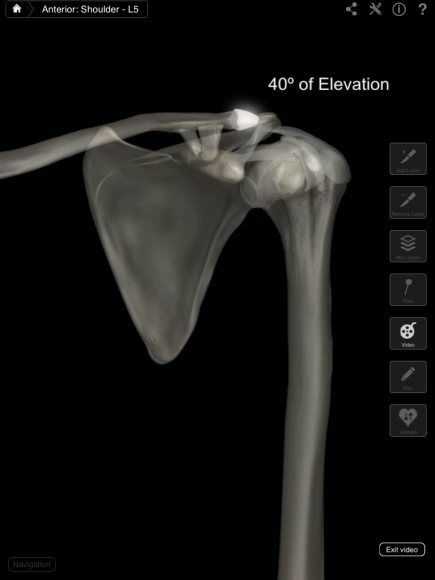 When it comes to 3D anatomy developers on the iPad, two major players immediately come to mind; Visible Body and 3D4Medical. 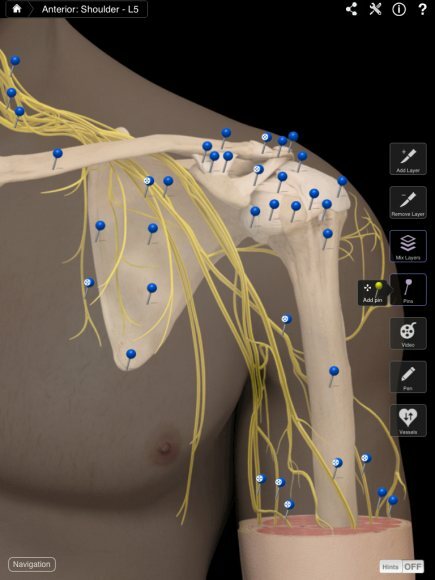 3D4Medical have released a series of major updates to its professional NOVA series which have been developed in collaboration with Stanford University School of Medicine. 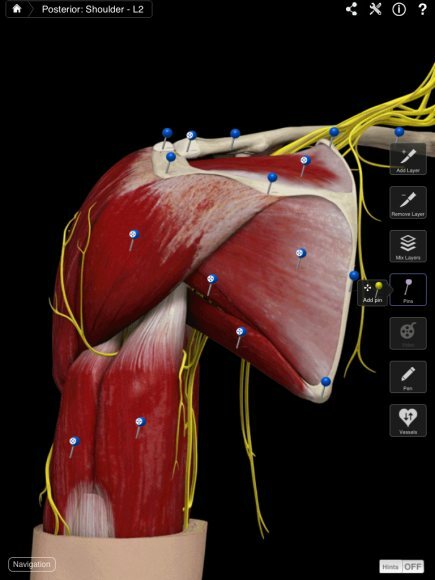 Systems based apps such as Muscle System Pro and Skeletal System Pro have been very well received although the lack of integration between these two apps has been noted in the past. 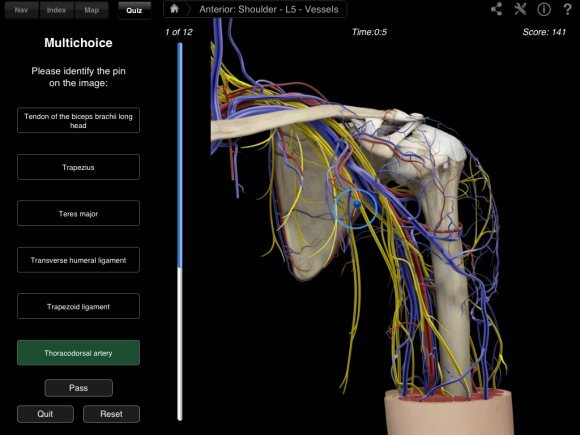 3D4Medical have elected to create a new range of “specialized” apps which will take a detailed look at one particular anatomical region. There are a number of apps in the series; Shoulder Pro, Hip Pro, Foot Pro and Knee Pro. 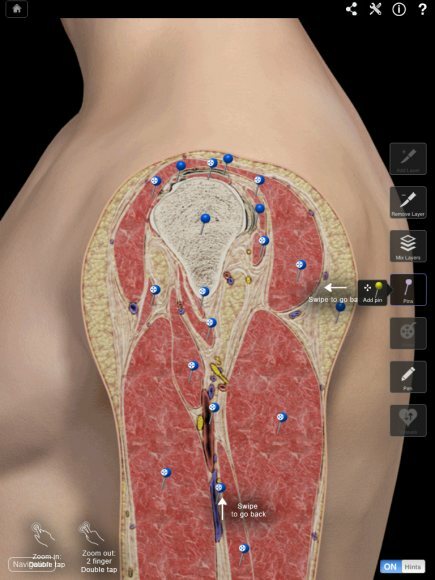 All these apps will appeal to medical educators, patient educators, junior healthcare professionals and anyone else who regularly deals with these anatomical regions. 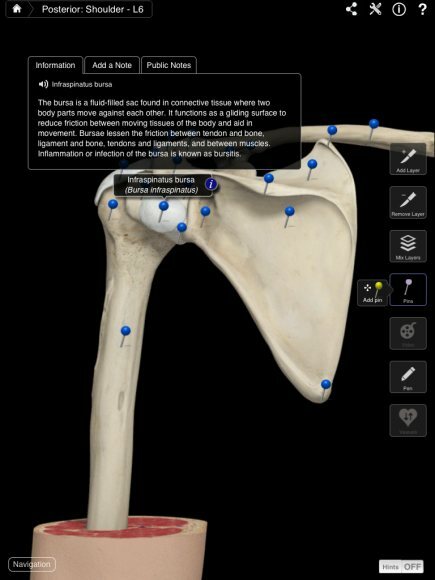 In this review, iMedicalApps will take a closer look at Shoulder Pro. 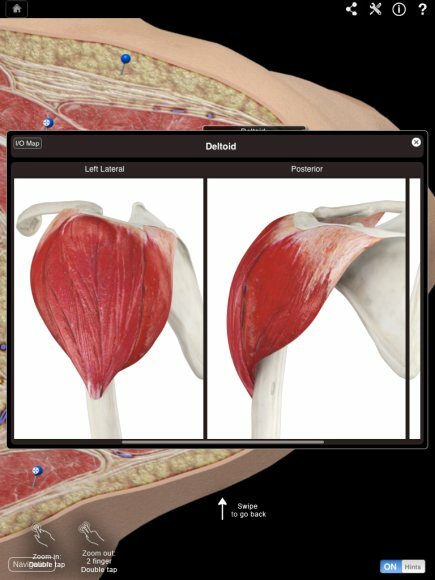 The first thing that you will notice upon opening Shoulder Pro is the extensive attention to detail with regards to the 3D model. This is the most photo-realistic to date and it is impressive. From the layers of sub-cutaneous fatty tissue to the complex interplay between brachial plexus and the shoulder muscles, it is clear that considerable time and effort has gone into designing this model. This is also reflected in the range of anatomical pins. There are vast numbers of pins covering the muscular system, the skeletal system, vascular and the nervous system. The anatomy is incredibly detailed (see screenshots). In total there are nine layers which can be manipulated and merged using simple touch gestures. 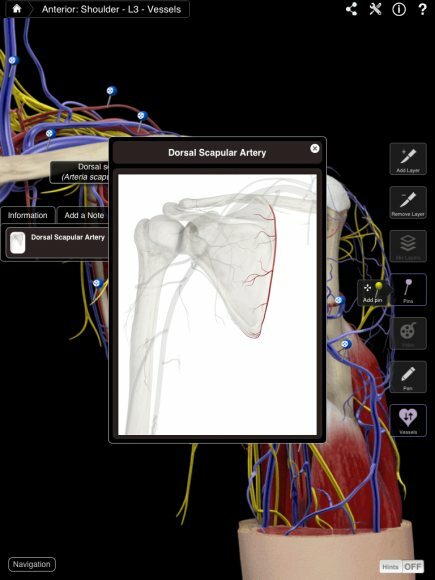 I was (mildly) disappointed to note the lack of detailed brachial plexus features and it would be nice if the vessels tab could alternate between arteries, veins or both as sometimes it was challenging to locate the arteries among the sea of blue veins. Overall, these drawbacks do not affect the overall outstanding quality of this app, though. Each pin is supplied with a considerable amount of useful information such as origin, insertion, innervation and vascular supply. The action of each muscle is noted and accompanied by a range of videos and extra images that isolate the particular muscle and its movement. 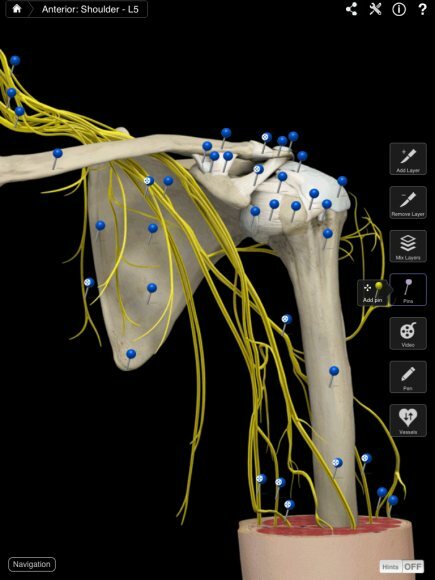 Shoulder Pro also takes advantage of some of the latest NOVA features including social note sharing, updated quiz function and annotation features. 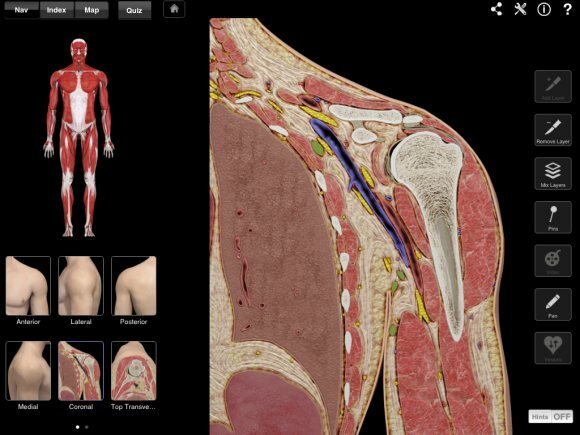 The two different quiz types allow the user to test their anatomical understanding while the index, navigation and map tab ensure that each structure is easily found. The NOVA series also contain robust export features including the ability to share notes via the app and screenshots via email, Twitter or Facebook. Huge amount of anatomical detail complete with a range of media.